How do we know if something is alive? If we are confronted with an entirely novel object what are we to make of it? If we just happen to have an EEG, EKG or a similar type of recording device around we might check to see if we can detect some kind of electrical activity that is normally indicative of a living organism. On the other hand, we might use a Turing test to see whether the object is intelligent or not. But these kinds of procedures take time. If we encounter something when we are just walking along the street and need to make an immediate judgement as to its biological status, these are not the kinds of procedures we would use. Probably the thing that would first strike us would be the presence or absence of some kind of coordinated movement. This could be the movement of arms and legs or perhaps the muscles of the face, if one is present, suggesting the existence of an internal emotional state. Most of us would consider that movement is a primary characteristic of being alive. If something doesn’t move it would be much harder, although perhaps not impossible, to convince us that it is actually a living object. This is a human prejudice. In Stanislaw Lem’s novel “Fiasco”, humans land on an apparently intelligent planet but fail to contact its inhabitants because they can’t detect any movement or other signs of life “as we know it”. Nevertheless, the planet is populated. Things don’t end well. The relationship between movement and life is an extremely complex one. What are the forces that are responsible for movement and how are they related to the forces responsible for life? Can we take an inanimate object and infuse it with some force that produces movement and how alive would such an object be? Questions like this have taxed human imagination from the earliest times. Ovid’s Metamorphoses tells us the story of the sculptor Pygmalion who fashioned an ivory statue that was superior to anything in Nature. He fell in love with his own creation. Pygmalion prayed to the Goddess Aphrodite to find him a wife who was as beautiful as his statue. Hearing his prayers, the Goddess transformed his statue into a living woman who he married. One might also consider the writings of Hermes Trismegistus or “thrice great Hermes”, the supposed author of the Corpus Hermeticum, a set of writings that exerted an enormous influence on many of the great thinkers of the 15th century Italian Renaissance including Marsilio Ficino and Giovanni Pico della Mirandola. In the dialogue called the Asclepius (after Hermes’ son Asclepius, the Greek god of healing) the art of imprisoning the souls of demons or angels in statues with the help of herbs, gems and odors, is described, allowing the statues to move and speak. It makes little sense from the perspective of modern science to ask precisely how Aphrodite or Hermes Trismegistus achieved these feats of transformation, only to note that they were considered to be the results of animating forces that pervaded the macrocosm. Closer to our own time we should note the many examples of human attempts to create realistic automata. Many early sophisticated examples of such things existed in the courts of the Islamic world with who Europeans came into close contact during the first crusade, allowing many technological secrets to be transferred from one culture to another. There are many remarkable examples of the incredible ingenuity behind the building of automata during the Middle Ages. The first automata, apparently self-moving manufactured objects to be built in Europe, were located in the park at Hesdin, a chateau in the county of Artois in Flanders. These automata, which depicted humans and animals, were built at the behest of Robert II, Count of Artois, in the last decade of the thirteenth century. After he died in 1302, his daughter, Mahaut (also called Matilda), inherited his title and lands and remained Countess of Artois, as well as Countess of Burgundy (her title by marriage), until her death in 1329. The park at Hesdin was later destroyed but then renovated by Philip the Good, Duke of Burgundy, who dramatically overhauled it and added many new clockwork automata in the middle of the fifteenth century. The park of the palace was full of mechanical marvels depicting humans and animals that could move, make sounds or speak. The birds were said to be so realistic that other birds “hearing their beautiful birdsong, were quite unhappy if they did not find their partner (mate)”. In other parts of the park humanoid automata played practical jokes on people like spraying them with water or even dumping flour on their heads. Even more amazing, perhaps, was the Hortus Palatinus, the garden of the palace at Heidelberg in the time of Frederick V and his bride Elizabeth Stuart, the daughter of James the First of England in the second decade of the 17th century. This was designed by Salomon De Caus, one of the greatest landscape gardeners/engineers of all time. The garden, which became known as the eighth wonder of the world, contained landscaped coded messages celebrating the love of Frederick and Elizabeth as depicted as the Greek nymph Pomona and her lover Vertumnus. There were numerous mechanical fountains, statues and other devices powered by the use of “water engines” derived from the flow of the waters of the adjoining River Neckar. 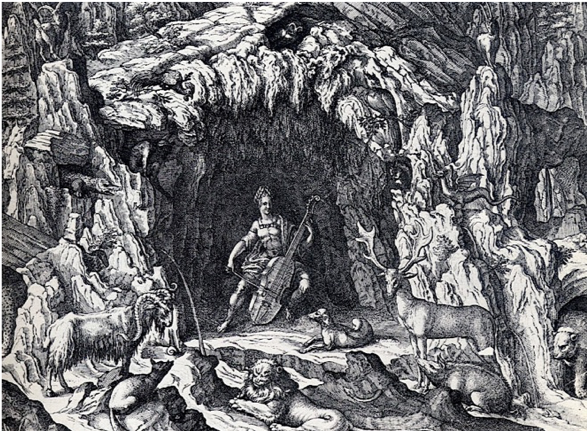 For example, (Fig 1) there was a grotto designed by De Caus showing Orpheus calming the beasts with his music played on the cello. Orpheus, his head crowned with laurel, was placed within a natural looking cave. Orpheus’ hands could be made to move by means of a concealed crank. Copper wire attached to his fingers would activate a hidden organ, making music reverberate throughout the grotto. But are humans machines or are they governed by different laws than those that apply to automata? The rise of modern science and the materialist philosophies in the 17th century ushered in new ways of thinking about the human body. Descartes, of course, famously supposed that our bodies were mechanical but were animated by an immortal soul, a view which falls somewhere in between the metaphysical and the world of modern science. And, indeed, it wasn’t long before others proposed views that were truly materialist. Julien Offray de La Mettrie born in France in1709 ,was a hard materialist and atheist. In his book “L’homme machine” (Man the Machine) he theorized that all the facets of human activity, including human consciousness, were the result of the workings of the material of the human body. He completely discarded all theological and metaphysical considerations to produce a picture of human biology which would be recognizable by most working scientists today. However, if man is merely a kind of machine then we might expect that, like all machines, it would eventually run down, something that anybody might observe every day of their lives as they move relentlessly ever closer to old age. But was such a thing really necessary? – sings Curley McLain in Oklahoma about the “Surrey with the fringe on the top” and, indeed, why shouldn’t machines go on forever? In the 17th century people thought that they could. After all it seemed that the heavens went on forever. The cyclical movements of the stars, the movement of the spheres, were things that would surely continue for all eternity. Why shouldn’t this therefore apply to machines here on earth? Hermetic thinking had decreed that the microcosm of the earth was just a reflection of the macrocosm of the heavens. Natural magic, which, as opposed to black magic, was considered a benign influence, was believed to operate through lines of force that interconnected every element of the cosmos. The scientific environment of the early 17th century was not influenced by considerations of the yet to be discovered laws of thermodynamics . Hence, there was no reason why a machine that went on forever, a “perpetuum mobile”, should not be built. 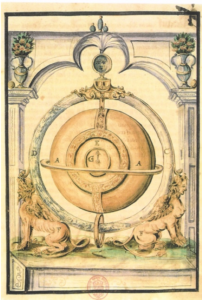 Fig 2.The Perpetuum Mobile designed by Cornelis Drebbel for King James the First. was another of the most spectacular geniuses in history when it came to the actual construction of intricate mechanical objects. For example, in 1620, he constructed the first working submarine (This was probably adapted from a rowing boat covered in greased leather, with a watertight hatch in the middle, a rudder and four oars. Under the rowers’ seats were large pigskin bladders, connected by pipes to the outside. Rope was used to tie off the empty bladders. In order to dive, the rope was untied and the bladders filled. To surface the crew squashed the bladders flat, squeezing out the water. Drebbel went on to build two more submarines, each one bigger than the last. The final model had six oars and could carry 16 passengers . It was demonstrated to the king and thousands of Londoners on the Thames, and could stay submerged for three hours at a depth of 15 feet. How Drebbel maintained an air supply remains a mystery but it was probably through the generation of oxygen through a chemical reaction (More on Drebbel here). Accounts suggest the boat could travel from Westminster to Greenwich and back under water, completing the return journey in three hours at a depth around 15 feet below the surface. We have been left several detailed descriptions of Drebbel’s perpetuum mobile from people who went to see it at Eltham palace and there are also several artistic impressions of it such as the following (see Fig 2) “AA is a round globe, which indicates, by two different hands the month and the day and in which signs of the zodiac the sun and moon are. B is a round globe representing the moon, and how it waxes and wanes, how old it is, and the connections between high and low water. CD is a glass ring. C is above and D is below the water, which moves all the time up and down, twice every twenty four hours, like the sea. All these movements proceed of their own accord and without one doing anything which is to be seen as the most wonderful thing on earth”. Drebbel’s perpetuum mobile became famous all over Europe and even attracted the interest of the Holy Roman Emperor Rudolf II in Prague who invited Drebbel to come and produce similar machines for him. Unfortunately, we don’t know exactly how long Drebbel’s machine would have lasted as it was broken in an accident after it had become the property of James’ wife, Anne of Denmark. Of course, our everyday experience is that machines don’t go on forever, something that is dictated by the laws of thermodynamics. This certainly applies to human machines. Indeed, certain human conditions particularly concern the run down of our mechanical abilities. Of these, osteoarthritis (OA), a degenerative joint disease, would be the most common and obvious. Here is a disease which, more than any other, compromises the machine-like aspects of our existence. Naturally, like any other disease that afflicts humanity, OA is something we want to “cure”. But what does that mean? Presumably the ideal situation would be to be able to produce human joints that would “go on forever” and never run down. Even if that isn’t possible how close to this ideal situation can we actually get? OA was originally described as a disease in which the cartilaginous material that covers surface of the apposing bones of a joint begins to break down. We now know that this is not the only change that occurs in OA afflicted joints. There is certainly breakdown of cartilage, but changes also occur in the underlying bone, the synovium that produces the joint lubricating synovial fluid, the innervation of the joint, stem cells that produce new bone and other joint cells and numerous other things as well. All of these processes occur simultaneously and changes in one simultaneously affect all of the others. This means that when we consider the function of a joint we need to conceive of the structure as a whole, including the way that all of its component parts work with one another. The manner in which machines function is governed by the laws of thermodynamics. According to the second law of thermodynamics, the arrow of time only points in one direction. Left to their own devices systems tend to distribute their energy which tends to disperse or spread out as time progresses. Entropy is a measure of this tendency, quantifying how dispersed the energy is among the particles in a system, and how diffuse those particles are throughout space. Systems will eventually reach a point of “thermodynamic equilibrium” in which their energy is uniformly distributed. A cup of coffee and the room it sits in become the same temperature. As long as the cup and the room are left alone, this process is irreversible. The coffee never spontaneously heats up again because the odds are overwhelmingly stacked against so much of the room’s energy randomly concentrating in its atoms. The situation is beautifully encapsulated by the 13 year old Thomasina Coverly, an Ada Byron like character in Tom Stoppard’s play Arcadia who says to her mathematics tutor “When you stir your rice pudding, Septimus, the spoonful of jam spreads itself round making red trails like the picture of a meteor in my astronomical atlas. But if you stir backwards, the jam will not come together again. Indeed, the pudding does not notice and continues to turn pink just as before. Do you think this is odd?” Not odd perhaps, just following the second law of thermodynamics! The laws of thermodynamics as originally stated provide an accurate description of closed systems –such as a closed box which is not connected to or influenced by the outside world in general. But, as was pointed out by none other than Erwin Schrodinger (yes, he of the Schrodinger wave equation) in a book published in 1944 called “What is life?”, living systems don’t normally behave in this way. Rather, they exist far from thermodynamic equilibrium maintaining states of low entropy. The reason why they can do this is because they act as “dissipative systems” in which they absorb energy, ultimately from sunlight or something derived from it, and dissipate it. The overall entropy of the universe increases even though the structure of the individual system is maintained. Indeed, according to some recent discussions, it is possible that in the origin of life itself, the principle driving the organization of particles on Earth resulted from the fact that they could then dissipate the energy of the sun more efficiently (more on the biophysics of the Origin of Life here). If a joint, such as the knee, represents an organized structure, constantly dissipating energy, then OA can be seen as a failure to achieve this. How then can we reverse this trend? In order for the structure of the joint to be maintained its component parts must work together in a manner that reflects its role as a dissipative structure. Presumably, therefore, there is a biological program that directs this coordinated behavior. For maximum efficiency, this program might operate under the guidance of a single master switch. Is there any evidence that such a thing exists? It’s an interesting story. Around 1950 Rita Levi-Montalcini, a young Italian doctor, was performing embryological research in the laboratory of Victor Hamburger at Washington University in St Louis. A series of brilliant studies led her to the discovery of Nerve Growth Factor (NGF), a protein which seemed to be required for the development and maintenance of nerve cells arising from sympathetic and sensory ganglia. This aroused a great deal of interest and many studies on the mechanism of action of NGF followed in subsequent years. It was discovered that NGF produced its effects through interactions with two receptors known as TrkA and p75. Moreover, it turned out that NGF was capable of producing many more effects than its original name suggested, regulating the development of many different types of tissues. Furthermore, in addition to its effects on development, it was also shown that the interaction of NGF with TrkA receptors could produce many very rapid effects. One of these was pain. The nerves that detect pain (nociceptors) arise from the dorsal root ganglia and innervate the skin, joints and the viscera. Different chemical factors produced during injury or inflammation can act directly on nociceptors to stimulate their activity allowing them to signal pain. It turned out that NGF can be produced rapidly under many of these conditions and then directly activated TrkA expressed by nociceptors causing pain. Pain is one of the major symptoms of OA and is the reason why most OA patients seek medical advice. But what exactly causes OA related pain? There might be many substances that are produced during OA that could initiate pain –but which of these are the most important? Finding new drugs for the treatment of OA pain is an important endeavor as most current drugs for treating pain are either ineffective in OA or are inappropriate for use under chronic conditions. Examination of OA patients demonstrated that during the development of the disease there was increased NGF in synovial fluid, at the osteochondral junctional synovium and cartilage. Might NGF therefore be an important factor in producing OA pain? This possibility was tested by injecting OA patients with an antibody which could target NGF and prevent it from activating its receptors. The results of these clinical trials were spectacular. Many patients reported considerable relief of primary pain symptoms. Seeing that OA is a very significant medical problem affecting millions of people throughout the world, it looked like monoclonal antibodies against NGF (the most common one is called Tanezumab) might be very useful indeed. But then something odd happened. Closer examination of the patients participating in the clinical trials showed that, although their pain was reduced, a group of them had actually developed more serious OA symptoms. This turned out to be particularly common when higher doses of the antibody were used or if it was used in combination with an NSAID (non steroidal anti-inflammatory drug), a common treatment of patients with OA. 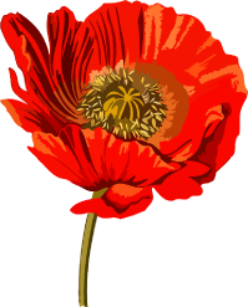 It should be noted, however, that the use of NSAIDS alone is not known to produce such effects. One of the most surprising things noted about the adverse effects of NGF antibodies is that they were not necessarily associated with the joint in which the symptoms of OA were originally reported but could manifest themselves in other joints throughout the body. Why do these adverse effects of NGF antibodies occur? Investigations of the effects of NGF in joint structures have revealed that not only is NGF produced by many of the cellular elements of the joint (see above) but it can also act upon them-TrkA and p75 being expressed in many types of joint cells. They are also expressed by immune cells that perform immune surveillance functions in the joint or enter the structure in association with inflammation of diseased joints. It is likely, therefore, that NGF can act as a coordinator of the entire function of the joint allowing it to sustain its dissipative structure. When this function is removed, either in an aging joint or under the influence of an NGF antibody, the coordinated functions of the joint decline in toto. A theoretical goal of OA therapeutics is to prevent the deterioration of joints and to allow them to function perfectly forever-in effect to produce a human perpetuum mobile. Therapeutic approaches to declining joint function have traditionally targeted individual sites of action in particular joint tissues. But the results with NGF antibodies have shown us that OA is a disease of the entire joint, not just one individual component of it. The realization that the evolution of the joint has been as a thermodynamically efficient structure under the control of an overall program directed by key organizing molecules may eventually give rise to therapies that allow us to become, if not perpetuum mobiles, at least free of joint disease for the entire course of our lives.